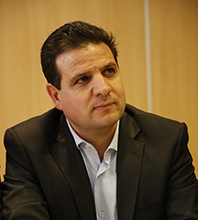 Ayman Odeh (Arabic: أيمن عودة‎, Hebrew: איימן עודה) was born on January1, 1975, in Haifa. He was the only Muslim student in his Christian school, but now describes himself as having transcended the confines of religion and ethnicity. Odeh studied law at Mihai Eminescu University. In 2001, he was certified to practice law although he is not a member of the Israel Bar Association. Between 2000 and 2003, Odeh was member of the Executive Committee of Al-Midan Theater in Haifa. From 2003 to 2006, Odeh worked as a project director at Sikkuy – The Association for the Advancement of Civil Equality. Odeh joined the Hadash Party (Democratic Front for Peace and Equality) and represented it on the Haifa City Council between 1998 and 2005, before becoming the party’s secretary-general in 2006. Odeh says his service in the Haifa city council made it clear to him that Arabs and Jews must work together. He failed to win a Knesset seat in either the 2009 or 2013 elections because he was placed far down on the party list and Hadash won only four seats. Prior to the 2015 elections, Odeh was elected the party’s new leader. In the buildup to the elections, Hadash joined the Joint List, an alliance of the main Arab parties, with Odeh at the top of the list. The four partners recognized that individually they would have a difficult time winning seats after the threshold for entering the Knesset was raised to 3.25 percent of the vote. Odeh rejected calls for the Arabs to boycott the elections. “It is unthinkable that decisions regarding our lives, our towns and villages, our education system, our society, will be taken without our participation,” he told Al Jazeera. “And with a strong representation in the Knesset, we will be not mere spectators on the political process, but active, leading and influencing it. The Joint List’s social agenda included a 10-year plan to tackle issues pertinent to the Arab sector, such as employment of women, rehabilitation of failing regional councils, recognition of unrecognized Bedouin communities in the Negev, public transportation in Arab towns, and the eradication of violence. He also said he supported the right of the Jewish people to self-determination in Israel, adding that a Palestinian state should fulfill the same goals for Arab Palestinians. Odeh opposes drafting Arabs into the Israeli army. Odeh was elected to the 20th Knesset, along with 12 other members of the Joint List, making it the third largest party. He was a member of the House Committee and the Labor, Welfare and Health Committee. He also chaired the Lobby for Culture in the Knesset. The Joint List broke up before the 2019 election and Hadash agreed to run jointly only with the Ta’al Party. Since 2015, Odeh has been member of the board of directors of the Mahmoud Darwish Foundation. Odeh has authored one book and two reference books. He is married to Nardine Aseli, a physician, and they have three children. Dalia Hatuqa, “Q&A: Ayman Odeh, head of the Joint List,” Al Jazeera, (March 16, 2015). Photo: Anan Maalouf, licensed under the Creative Commons Attribution-Share Alike 3.0 Unported license.